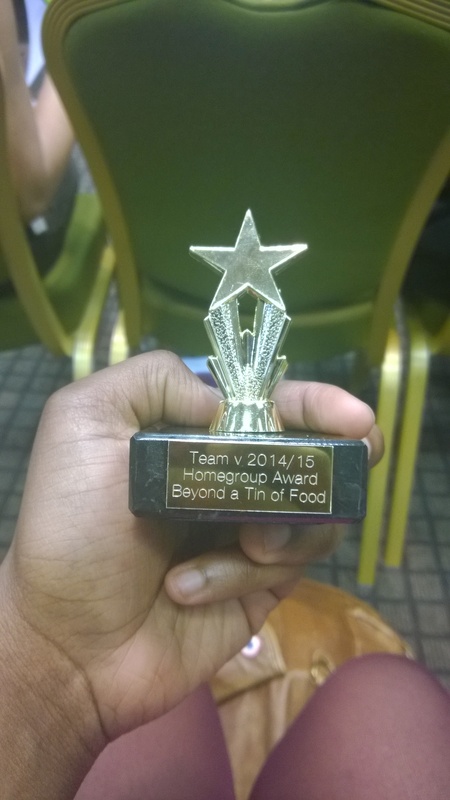 As the first Team v campaign, “Beyond a Tin of Food,” ended one month ago the next one needed to kick off! And, how do Team v campaigns kick off? With a weekend of training away from home, of course! Therefore, last weekend I spent it in Rugby, Northamptonshire, for the second Team v residential. I woke up on Saturday really early but full of excitement. I couldn’t wait to know the social issue of the next campaign, but on top of everything, I couldn’t wait to meet the rest of Team v leaders again. As weird as it sounds, I missed them. In the first residential I talked to a lot of people, I expressed my feelings and opinions without having the fear of being judged, I laughed when I wanted and I danced when I felt like dancing, all in an environment I felt very comfortable to be myself. You may think, “Well, that are things that everyone does”, but when I moved to England in 2012, I became an extremely introverted person. I wasn’t very extrovert in Spain neither, I have had socialising issues since I was a kid, but the situation in England was quite worrying last year. Fortunately, everything improved. I’m still quite introvert in places such as college. But volunteering programs such as NCS, which I completed in 2013, and Team v, which I’m doing now, are helping me to develop self-confidence. Not only because of the programs themselves, but because of all the friends I am making. I like to surround myself of people that make me a better person, and I found that type of people in Team v.
The journey to Rugby was smooth, this time I didn’t get confused with the tubes in West Ham, nor I had to run for the train in Euston station. And I met other Team v leaders in the last train I took, so I had someone to chat with, instead of being bored for an hour. The arrival to the hotel was prompt, and the first thing we did was eat. Meals are somehow an important part of Team v’s residentials. Not only because the food is delicious (mainly the desserts), but because they are the times of the day in which everyone shares what they have been up to. During the weekend, I tried to sit with people I didn’t talked much with in the first residential, in order to meet new people. It worked out quite well: people have some amazing stories to tell. After lunch, it was time of reflection and evaluation of campaign 1: thinking about positives, negatives, successes, failures and, on top of all, solutions. For my surprise, everyone seemed to have similar struggles, such as managing their volunteers and engaging with organisations: I wasn’t alone! When comes to my own campaign, I think that the main negatives were my bad time management skills, not hearing back from foodbanks and being rejected by supermarkets. The main positives were the huge amount of motivation my volunteers and I had, and the fact that our money collection went towards the Christmas meal of homeless young people! Without doubt, the positives overshadow the negatives here. For the next campaign, I’m committed to have better time management skills, and not hide myself behind emails when trying to get in contact with organisations. From now on, calls first, emails later! 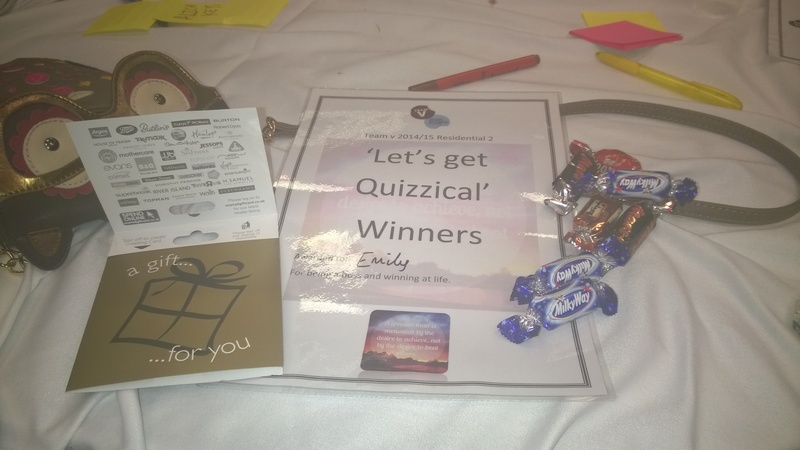 Various Team v leaders were rewarded for different aspects of their campaigns, such as creativity, media… It was a great time to recognise people’s extraordinary achievements. I didn’t win any individual award, but my home group won an award for having the most points, which come from the number of targets met during the first campaign. I was shocked, because I didn’t achieve many points, but I felt happy for my peers. I would like to say that every single Team v leader achieved something in their first campaign. Small or big, creative or not, innovative or old-fashioned… Success is success, and it is difficult to measure it. Awards are always quite subjective, and more when comes to deciding who ran the best social campaign. My one wasn’t nothing special, but I know people that had great ideas such as selling their own clothes in markets or running thoughtful debates with politicians, and didn’t receive any awards. What I’m trying to say that even if it is nice having your merits recognised, you should never do things expecting praise and rewards, because the chances are one in ten. The best projects are made through real inspiration, strong commitment and love, not just greed for money and applause. Following the big reveal, we had two training sessions with professionals from The Children Society, an English charity that helps disadvantaged children and teenagers. 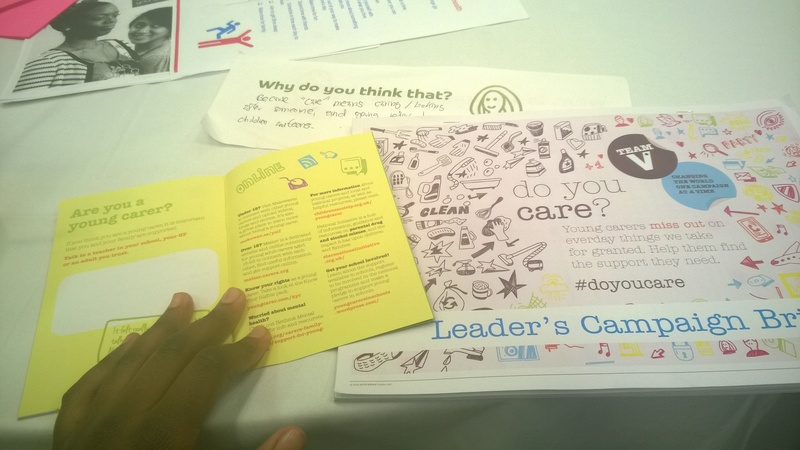 The first training session was a quiz, through which we learned about different facts and statistics related to young carers. 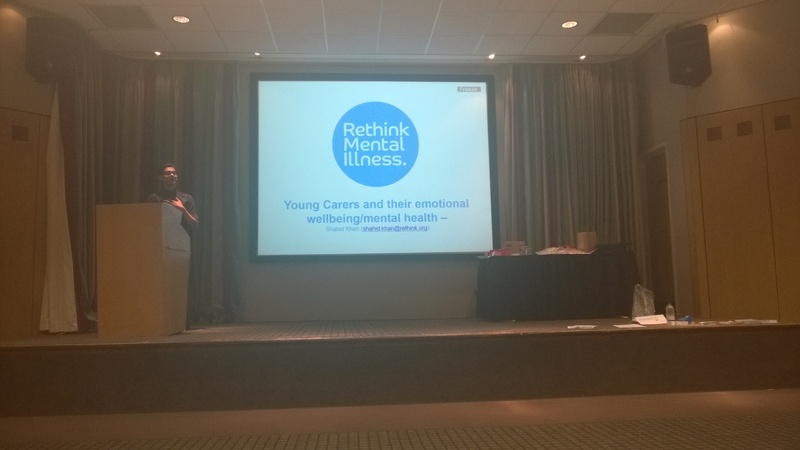 The second training session was about the challenges and implications of being a young carer, as well as the support services in place for young carers. Both of them were interesting, and they helped to erase from my mind any sort of prejudgements I could have. 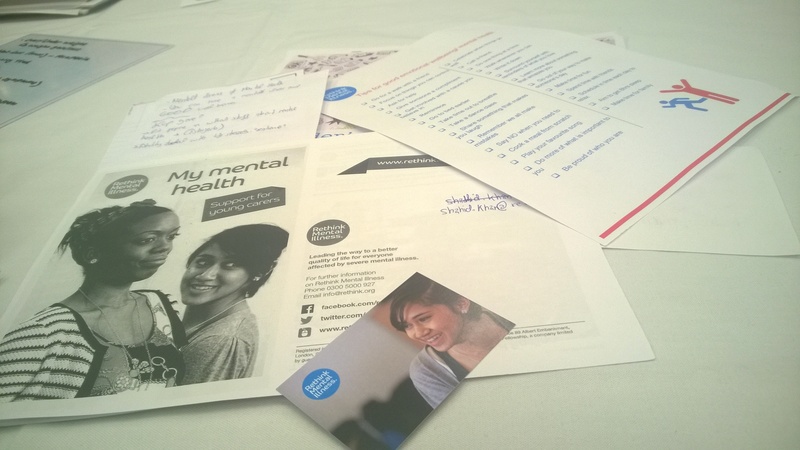 During the afternoon, we also had training with the charity Rethink, which was about emotional wellbeing and mental health. This session was very important to me. 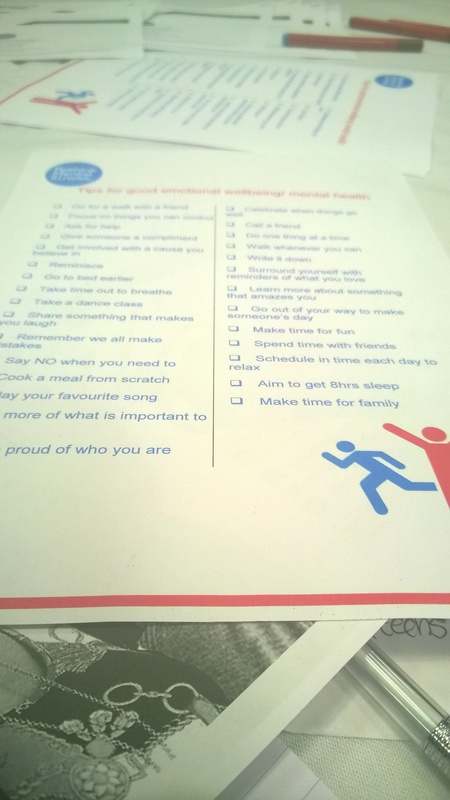 I didn’t learn anything new, but emotional wellbeing and mental health are emotive topics that affect my everyday life, so it is never bad going over them. To finish off the training of the day, we had a guest speaker, Jenny. She is a young adult who was once a young carer, when she was 14 years old. She had to take care of her mother, diagnosed with Parkinson, till she died. Her speech was very touching and inspirational. It is difficult to open up about the past and situations that hurt us a lot, and I admired her bravery to come forward and share her experiences. Moreover, her situation felt so close to my own past experiences, so I couldn’t help but feel connected with many of her words. What I loved about her speech is how much she tried to explain how badly her emotions were affected during that dark times. Often we only look at the physical side of things, and we overlook others that can’t be seen, such as emotions and feelings. To me, damage to my mind hurts more than damage to my skin or muscles. I deal well with physical pain, while mental distress is my biggest enemy. I hate when people try to act like if issues such as social anxiety, bipolarity or depression aren’t real because you can’t see them. Mental illnesses are serious, and the current lack of support and understanding in society is concerning. So I liked how Jenny reinforced the importance of mental health when having such a huge caring responsibility. On Sunday we had an intensive day of training. 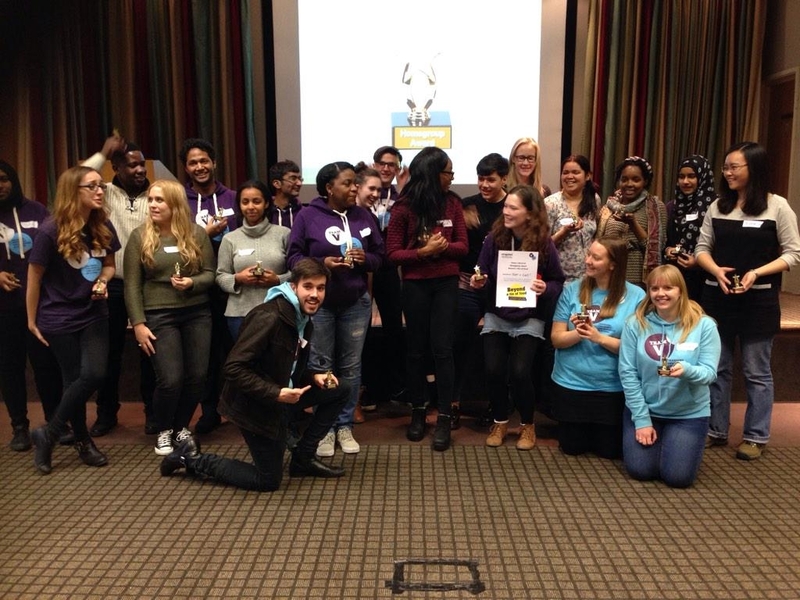 The sessions were: running a workshop, campaign planning, engaging volunteers, and creating links with organisations. The first three were ran by Team v staff members, and were pretty straightforward. I adored the one about engaging volunteers: they talked about positive and negative energy, how they affect your performance as a leader, and how you can manage both of them. This session was very enlightening and inspirational, it even included how to accept your weaknesses and strengths, as well as managing and facing your fears to progress. Absolutely marvellous. Essential stuff that everyone knows, but sometimes you forget. However, my favourite session of the whole weekend was the one about creating links with organisations, ran by Citizens UK, specialists in community organising. It was the training in which I learned the most. As I have said, I’m not good socialising, and my speech is awful, so I don’t like talking with others face to face. I don’t know how to approach people, both in formal and informal situations. Nevertheless, after the training, I understood the basics of connecting with professionals in an effective way. It was such an educational and informative session. Not only for Team v campaigns, but also for life. And more for the career I have decided to pursue (international development). With this last workshop, the weekend of training ended and everyone packed to go home. Fortunately, there wasn’t an issue with trains this time, and I managed to get home fine. Overall, resi 2 was awesome! I preferred its trainings sessions over the ones of resi 1 (though the public speech session of resi 1 remains the best training ever!). I managed to speak to more people and have nice chats. I had fun and I laughed a lot. I ate very well and I felt relaxed. I took with me a gift card and an award, unexpectedly! However, the whole training weekend happened too quickly. Fitting everything into just two days was almost certainly not the best for me: I ended extremely tired and it was difficult to digest everything. Moreover, both days were extremely intensive, and I felt like if during workshops and sessions, staff delivering them talked very quick and rushed all the activities, because there was no time enough to expand on them. 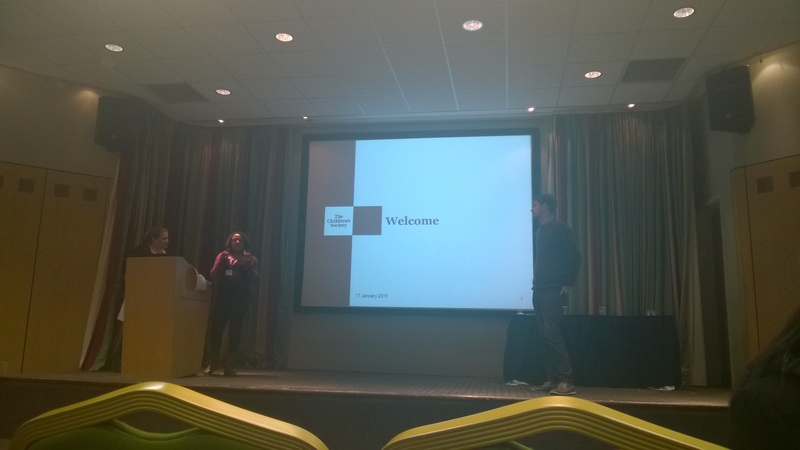 For instance, I would have liked a longer session for the creating links with organisations training. Without doubt, I got the message of each of the trainings, but I can’t assure I understood all of them. I didn’t have time too. So now, I have to go over my notes and the powerpoints again when I have time, to make the sure the information delivered sinks in my head. Anyways: I’m ready for #DoYouCare! I expect great things from this campaign, and I feel so motivated about it. It is a close issue to me, and the links with mental health are too important for me to overlook them. Wish me luck, hopefully I manage to thrive during the next seven weeks!